As you may or may not know, as I post about it every so often, Essie Dominica Green is my #1 lemming. I honestly can't tell you why, either. Greens in general have a tendency to look crappy on me, though dark greens, much less so. However, it can still be a crapshoot. Doesn't matter. I still need it. I know some people would give their right arm for Essie Starry, Starry Night. Well, Essie Dominica Green is my Starry, Starry Night. 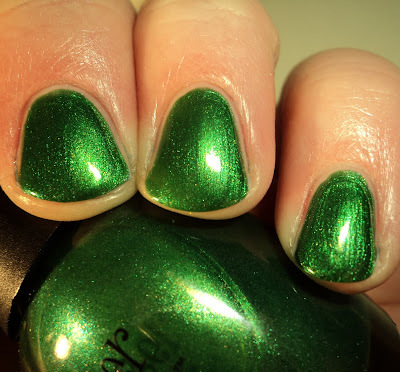 I know in the past, Essie herself has been asked if she would bring back Dominica Green, and all she does in hem-and-haw around the subject, so I'm taking that as a no. Even though it seems a bit frostier than Dominica Green, it's still a gorgeous bright green with golden shimmer, much like DG. So in that regard, I think it's a very good lemming-killer. I'd heard that the Essie was on the thin side, however Sketch N Etch is not. In fact, it's opaque at 2 coats. Part of me will still want Dominica Green for the rarity of it, but as far as color goes, I'm very happy with Sketch N Etch. Fingerpaints are readily available at Sally Beauty B&M stores and online. Price is $4.49 with your Sally card and $4.99 without.